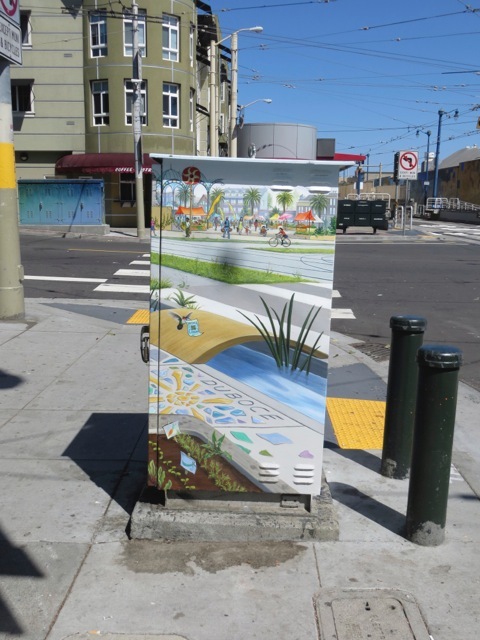 Many talented artists grace San Francisco with their beautifully painted murals. 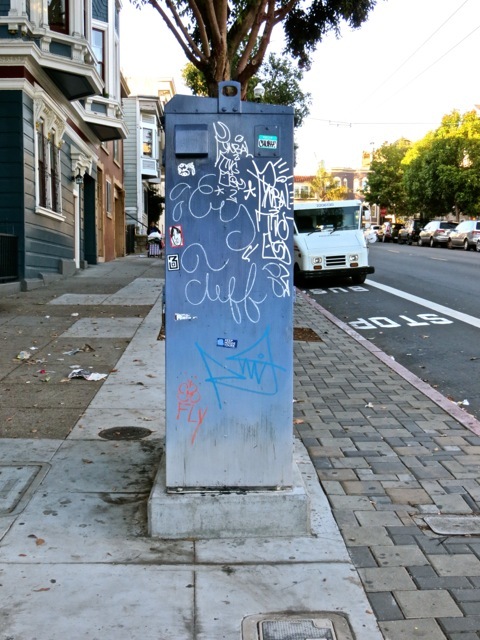 But there are also many anti-social people who deface properties with their ugly graffiti. There is a constant battle between these constructive and destructive groups. I see this as a battle between good and evil. 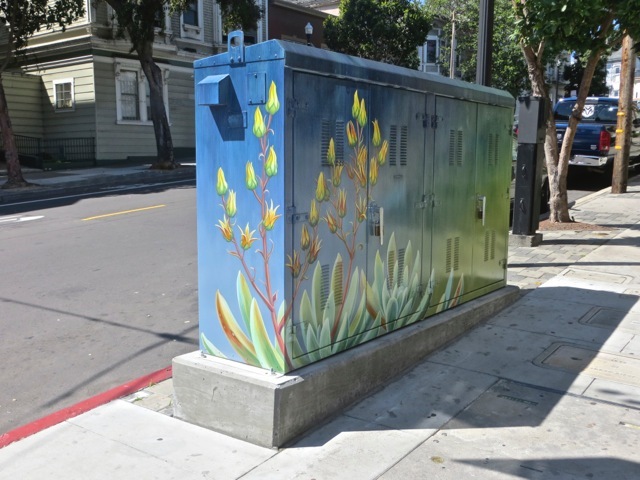 The city government permits murals be painted on building, but orders building owners to remove graffiti on their properties. 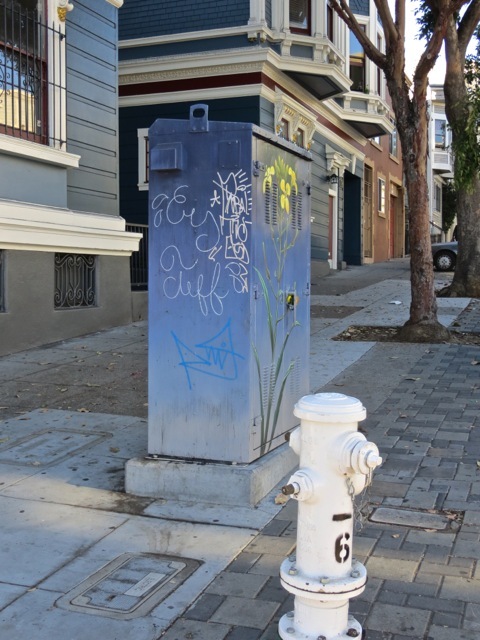 The difference between mural and graffiti can sometimes be difficult to define, but most people would recognize deplorable graffiti when they see it. 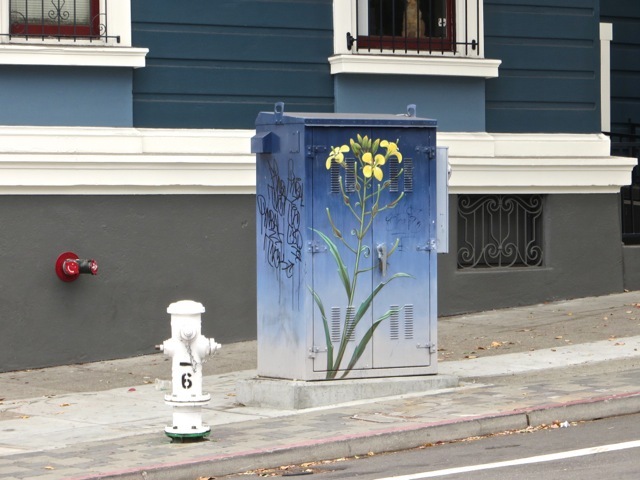 One one street corner, electric boxes have been carefully painted with evocative pictures. 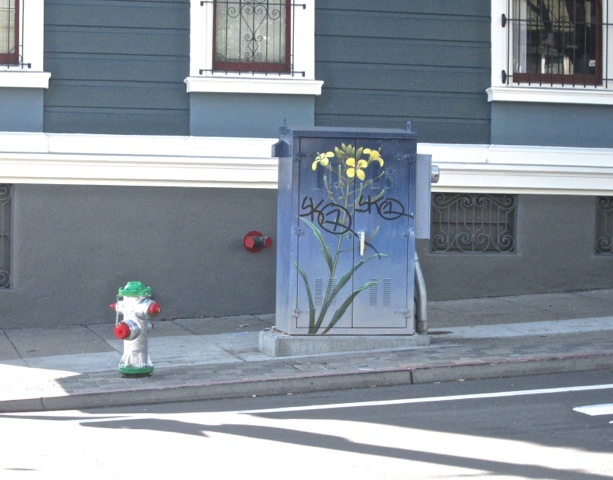 Professionally painted flowers beautify the neighborhood. 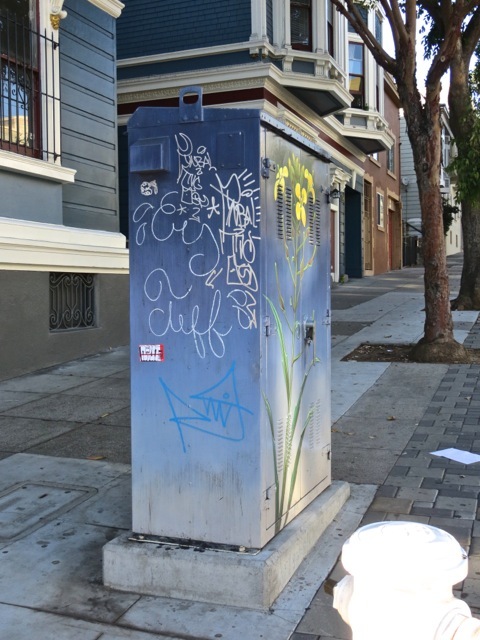 One of these electric boxes is the battle ground between good art lovers and evil graffitists. 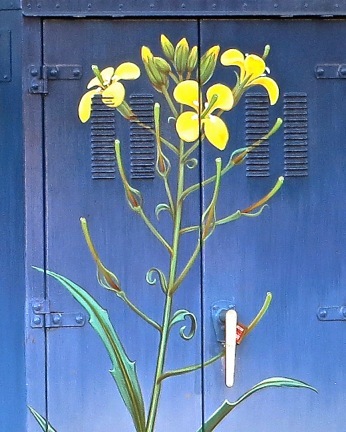 White paint was sprayed on the flowers. 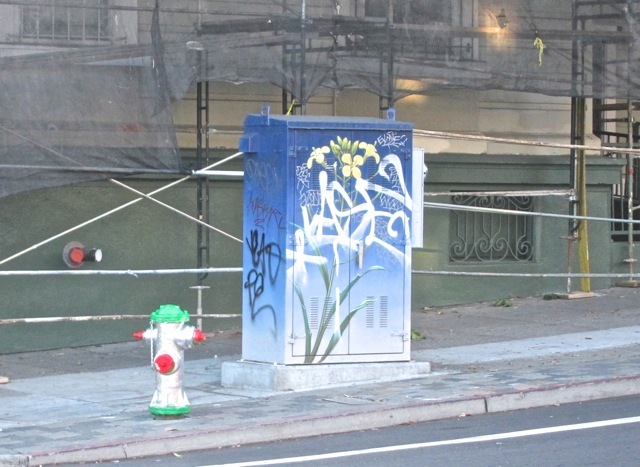 Six more graffitists added to the mayhem. 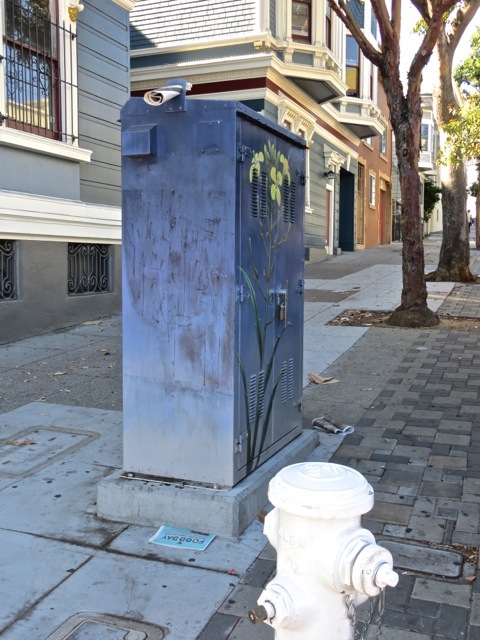 By January, 2014, all the graffiti had been carefully removed and the flowers regained their pristine beauty. The graffiti on the building netting were left untouched, and the building owner would receive orders to remove them. 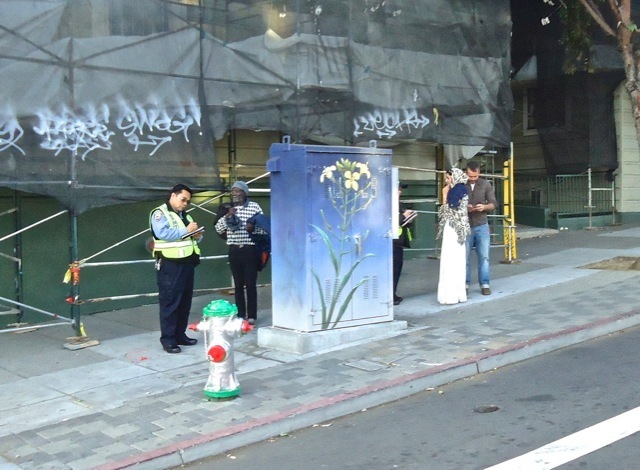 San Francisco public transportation uses the honor system whereby passengers pay fares voluntarily. Uniformed checkers occasionally demand proof of paid fare, and those without proofs are given summons for $105. These alleged farebeaters were being given summonses at the bus stop. 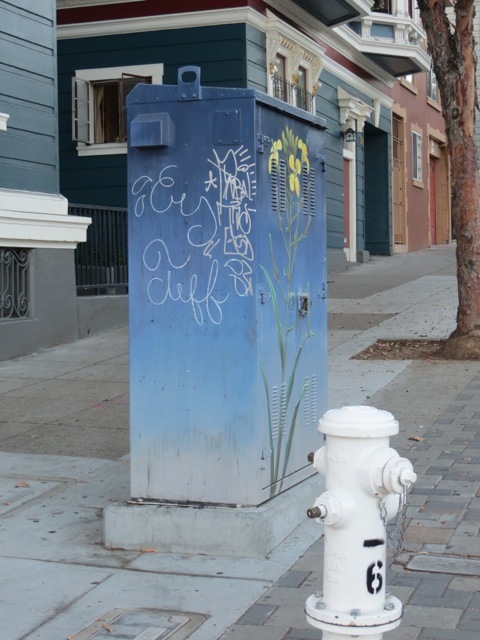 After two months, graffiti were prominently drawn on the flowers again. 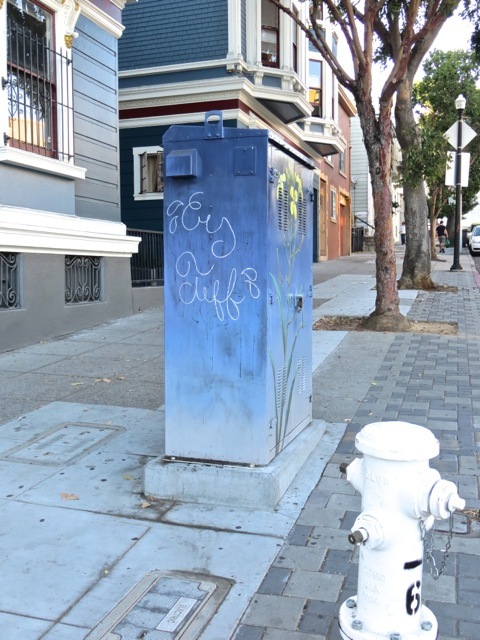 This time, the graffiti were removed within days. The good side was keeping vigilant. 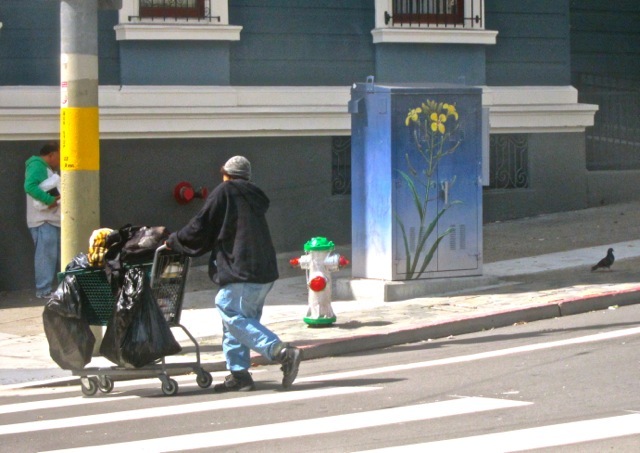 A scavenger walked by with his hoard carried in a misappropriated supermarket shopping cart. 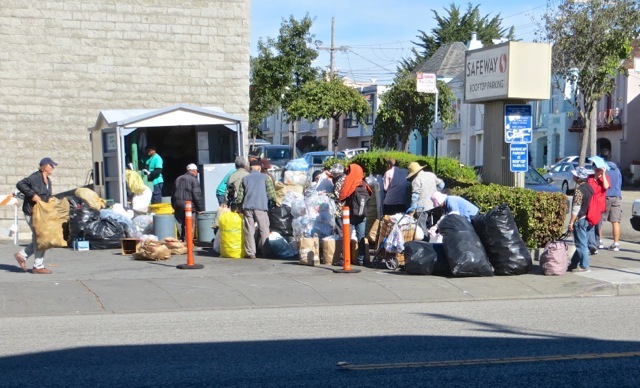 About half of San Francisco’s scavengers are poor elderly Chinese persons. They redeem their collected cans and bottles for a few dollars. With little employment opportunities, they work hard on the streets for the meager income. 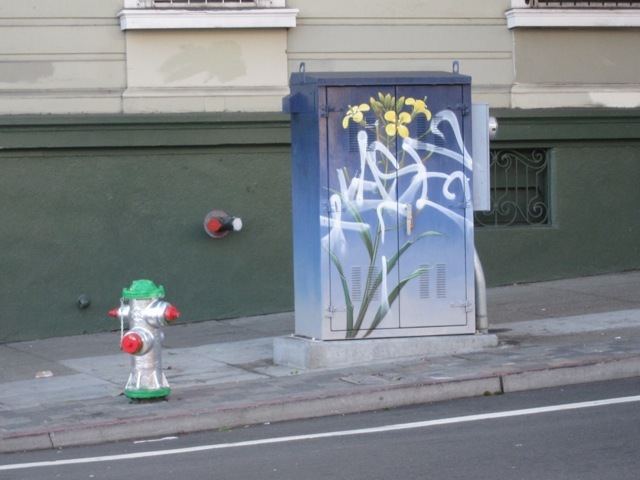 The graffitist defaced part of the painted flowers. But the more extensive graffiti was reserved for the side panel. The graffiti was removed half heartedly. Perhaps the good guys were getting tired of the cleaning. The evil side gained strength. In two months, they unleashed a furious combination of punches. If this were a boxing match, the referee would be watching very intently after six unanswered punches. He may step in any time now to declare the reeling good side defenseless and KO’d. Looks like the evil side is winning. I am depressed. Posted by Robert Wu on Saturday, November 1, 2014, at 6:18 pm. Filed under Uncategorized. Follow any responses to this post with its comments RSS feed. You can post a comment or trackback from your blog.